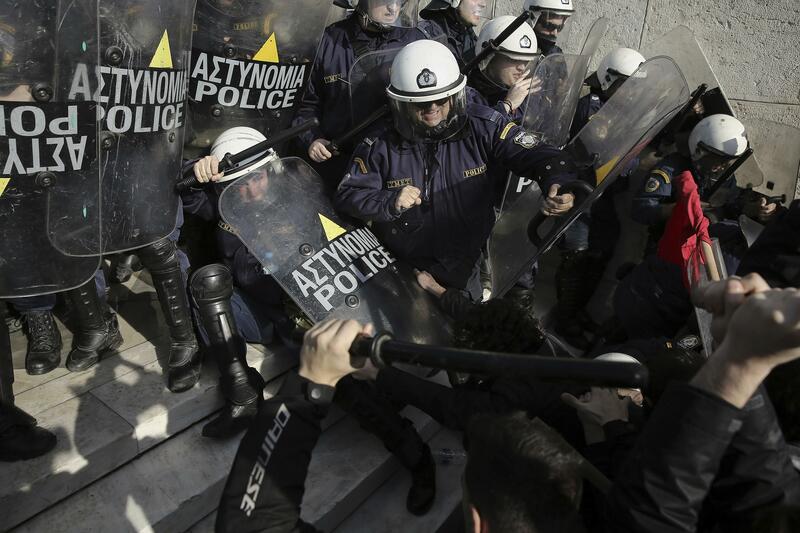 Fri., Jan. 12, 2018, 9 a.m.
ATHENS, Greece – Police fired tear gas in brief clashes with protesters and strikes halted ferries and disrupted public transport Friday, as unions stepped up protests against a new austerity bill that will limit the right to strike and speed up property foreclosures. More than 8,000 protesters joined a demonstration in central Athens as strikes disrupted public transport in the capital. At the end of the rally, police briefly clashed with protesters on the steps of parliament. No arrests or injuries were reported. The austerity bill, to be voted on late Monday, is considered to be potentially the last major package of cuts before Greece heads toward the end of the bailout program in August. Giorgos Perros, a senior member of the Greek Communist Party and a lead organizer of Friday’s rally, promised to intensify protests ahead of Monday’s vote. “Let them vote for whatever they like. We won’t stop,” he said. Amid a collapse in confidence, Greece lost the ability of raising money in international bond markets in 2010, but after years of budget restraint there are hopes that the country’s economy faces a brighter future. The yield on the country’s 10-year bond, for example, has dropped to below 4 percent – its lowest in more than a decade, a clear sign that investors are more hopeful about Greece’s economic prospects. Under the draft law, unions will require a larger number of members present at a strike vote for the protest to be considered legal. But government spokesman Dimitris Tzanakopoulos described the proposed change as minor. More union protests are planned Monday, including a three-hour work stoppage by air traffic controllers, set to halt flights between noon and 3 p.m. local time. Public transport and public hospital workers are also planning strikes and stoppages. Published: Jan. 12, 2018, 9 a.m.